Facebook scrapped its group buying program after only four months, while Yelp cut its Deals staff in half. NEW YORK (CNNMoney) -- Groupon's success in the daily deals space spawned hundreds of copycat sites and inspired big companies like Google to hawk their coupon services. Skeptics said the near-immediate market saturation meant Groupon's business was easily replicated -- and therefore doomed. But two key rivals in the field have already scaled back their deal efforts. 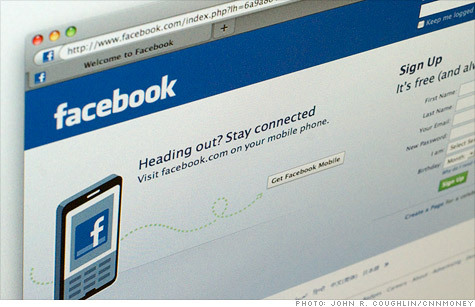 Facebook pulled the plug Friday on Facebook Deals, after only four months of testing the offering out in five cities. When Facebook announced the deals program in April, sites including ReadWriteWeb proclaimed it a game-changer, saying "Groupon doesn't stand a chance." Facebook "learned a lot from our test ... [and] we think there is a lot of power in a social approach to driving people into local businesses," the company said in a written statement. "We'll continue to evaluate how to best serve local businesses." A Facebook representative confirmed that check-in deals -- discounts that pop up when Facebook users share their location with the site -- will remain. The buy-in-advance deals, however -- the ones that directly imitated Groupon -- are being scrapped. Meanwhile, reviews site Yelp cut half of its Deals staff on Monday. Yelp Deals launched one year ago in San Diego and soon expanded to cities across the country. Yelp will keep running Yelp Deals, but it cut 15 positions and will redeploy some of those staffers internally to other projects. The deals service is just "one offering in our portfolio of ad products," Yelp said in a prepared statement. "This shows that just having a big name and a big audience isn't enough to make daily deals work," says Jim Moran, co-founder of Yipit, which aggregates deals and tracks the space. Groupon itself is not profitable, but it's growing: Its subscriber base now stands at 116 million, up from 83 million at the end of last quarter. Hundreds of daily deal sites: Yipit is currently tracking more than 360 active daily deals sites in the U.S. -- and each month, dozens of new ones launch, while others disappear. July had 36 launches and 38 shut-downs. That's the first time since Yipit began tracking that more sites closed than opened. But the fallen sites aren't necessarily an indicator that daily deals are becoming passe, Moran says. The number of deals is increasing: Yipit is now tracking more than 30,000 offers per month. "Clearly, people are interested in deals, and the market is growing," Moran says. "It comes down to offering deals in a certain context -- and if that's not right, a service can fail quickly." Yelp Deals "started incredibly strong," Moran says, scoring an average of more than $30,000 in gross revenue per offer at the beginning of the year. The industry average is $10,000 per offer, while bigwigs Groupon and LivingSocial average $13,000 per deal. As Yelp Deals expanded to more cities and more offers, though, revenue per deal declined to about $10,000. As a result, Yelp scaled back the number of offers. It ran more than 60 deals each month in June and July. August is on track for fewer than 30. "I do think there's a space for Yelp and Facebook to benefit, but they need to figure some things out," Moran says. "And other big companies, like Google and Amazon, seem to be very well positioned." Google (GOOG, Fortune 500) has embarked on a slow but steady march into the deals space in recent months, with its new Google Offers in a few cities as well as Latitude check-in deals. This month Google acquired The Dealmap, which aggregates local deal and displays them on a map. Last week Amazon (AMZN, Fortune 500) launched a deals site called AmazonLocal, which includes offers in 30 cities. Amazon is also an investor in LivingSocial.